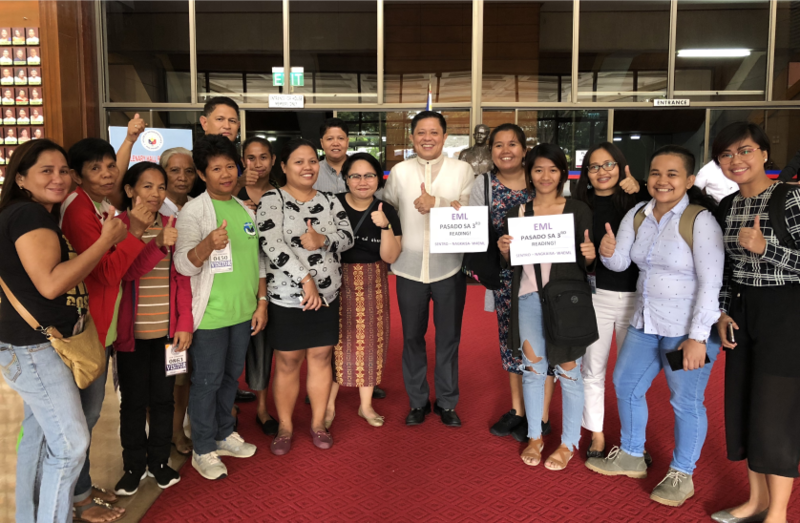 Akbayan Women lauds the passage of the paid, Expanded Maternity Leave in the bicameral committee on Monday. "It is the birth of a new era for Filipino families. This new maternity leave bill allows both mothers and fathers to take the time off and take care of their child. The solidarity work of the labor and the women's movement have won this bill. It is time to expand our values through the expanded care for careworkers. The role of care is the role of all," Mylene Hega of Akbayan Women said. The bicameral committee in the bill allowed for a 7 days quota for fathers. The bi-cam has set 105 days for paid maternity leave and additional 15 days for solo parents. "This is a breath of fresh air for Filipino mothers who have contributed so much to the economy but get less of the time and care they deserve from the state. We expect more happy and healthy workers and families from this," Hega added. SAAN AABOT ANG 20 PESOS MO? This is the question posed by members of Akbayan Partylist who trooped to Blumentritt Market clanging their pots and pans in a "Kalampag protest" against the"insulting" PHP 20 minimum wage increase in NCR. Mothers and urban poor leaders led the "#NasaanAngMalasakit:Kalampagin ang Gubyerno on Poverty and Hunger" campaign and opposed the meager wage hike that will not address rising prices of basic goods due to inflation and the Duterte administration's TRAIN Law. “Saan aabot ang P20 mo? Dalawang sakay lang ng jeep, ubos na ang umento para sa aming mga nagtitiis sa minimum wage. Nakakainsulto ang pekeng umento na ito,” Nerisa Balarao said, a mother and a leader from Akbayan Partylist Manila. “Wala pang solusyon ang gobyerno para sa aming hirap at gutom sa panahon ng nagtataasang presyo. Huwag naman sana magbingi-bingihan ang adminstrasyong Duterte sa aming mga hinaing,” Balarao added. “Mangangalampag kami hanggat mapababa ang presyo ng mga bilihin, masolusyonan ang krisis sa bigas at mabigyan ng sapat na ayuda kaming mga mahihirap na pamilya,” Balarao added. Akbayan condemns the warrant of arrest against Senator Antonio Trillanes IV, aligning to President Duterte's plot to revoke the senator's amnesty and silence him. 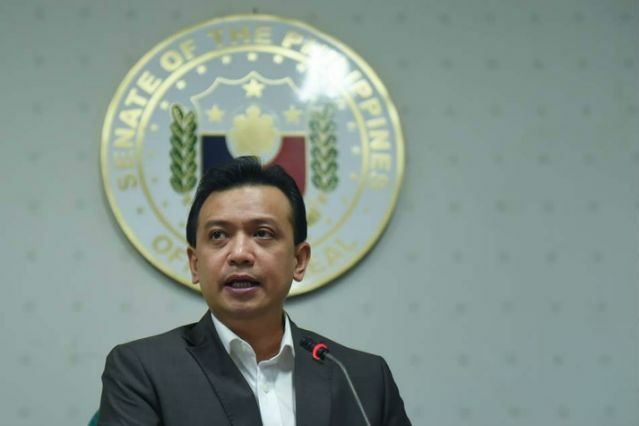 The order of arrest versus Senator Trillanes is the height of the Duterte government’s insecurity and cowardice, having no real solution to the country’s woes. President Duterte's trust ratings are plunging as he has failed to address the rice and price crisis, issues that matter to the poor majority of Filipinos. The arrest of Trillanes does not solve the hunger and poverty experienced by Filipino families brought by Duterte's failed policies. These recent events show that the political persecution is beyond Senator Trillanes. President Duterte is corrupting his powers to arrest those who are speaking up for the truth. In these times, anyone can be arrested just because the president said so. Furthermore, this maneuver comes straight from a dictator’s playbook to jail the opposition. Members of Akbayan Partylist trooped to Commonwealth Market clanging their pots and pans in a "kalampag protest" against poverty and hunger on Tuesday morning. 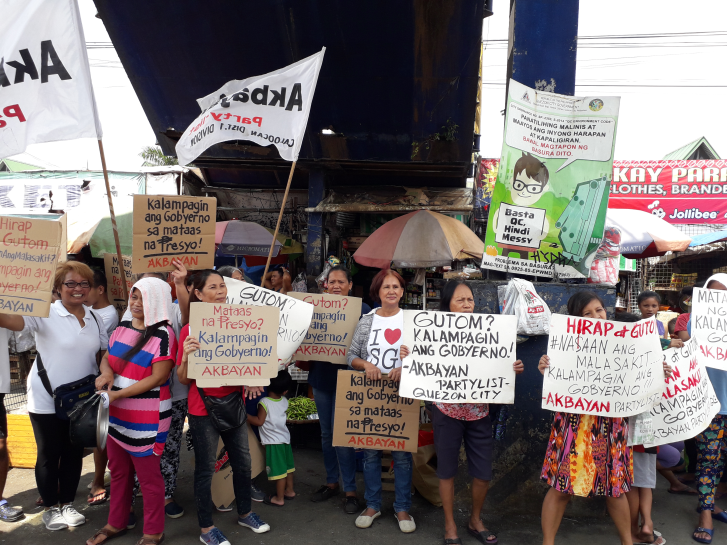 Mothers and urban poor leaders led the #NasaanAngMalasakit: Kalampagin ang Gobyerno Laban sa Kahirapan at Gutom" campaign and opposed the rising prices of basic goods due to the Duterte administration's TRAIN Law and the government’s failure to control inflation rates. 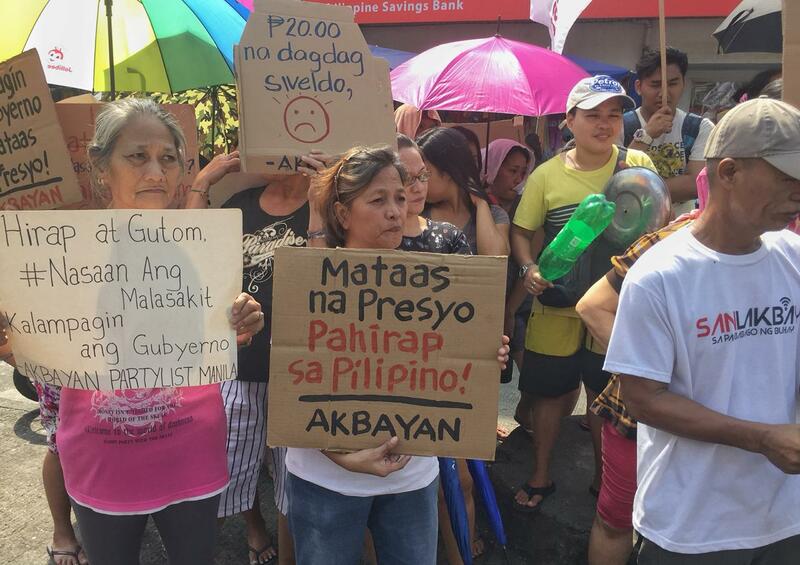 “Matapos ang ilang buwan, wala pa ring gumaganang solusyon ang gobyerno sa nagtataasang presyo ng mga bilihin,” Vives Moreno, a mother and Akbayan QC community leader said. “Kinakalampag namin ang gobyerno dahil tila nagbingi-bingihan pa rin si Duterte sa hinaing ng mga pamilyang gutom,” Moreno added. Akbayan also railed against the alleged P2-B “rice tara-ffication” corruption scandal in the NFA exposed by Senator Risa Hontiveros in a privilege speech yesterday. “Nakakagalit na habang nagkukuntsaba ang NFA at mga pribadong sektor para kumita sa krisis sa bigas, wala ng laman ang aming mga kaldero at tiyan,” Moreno said. “Huwag niyo pong hayaang magugutom kaming mga mahihirap. Mangangalampag kami sa inyo hanggang maibaba ang presyo ng bilihin at masolusyonan ang krisis sa bigas.” Moreno ended. Akbayan Women lauds the passage of the Expanded Maternity Leave Bill in its third reading at the House of Representatives today. The bill raises the bar of the country’s maternity law, from 60 days to a hundred days in compliance to the international standards set by the World Health Organization and the International Labor Organization. “Greater maternity days for women, will allow the body of the woman to recuperate from pregnancy. Its eventual passage creates an enabling legal environment for women that expand women’s choices and agency over her body. 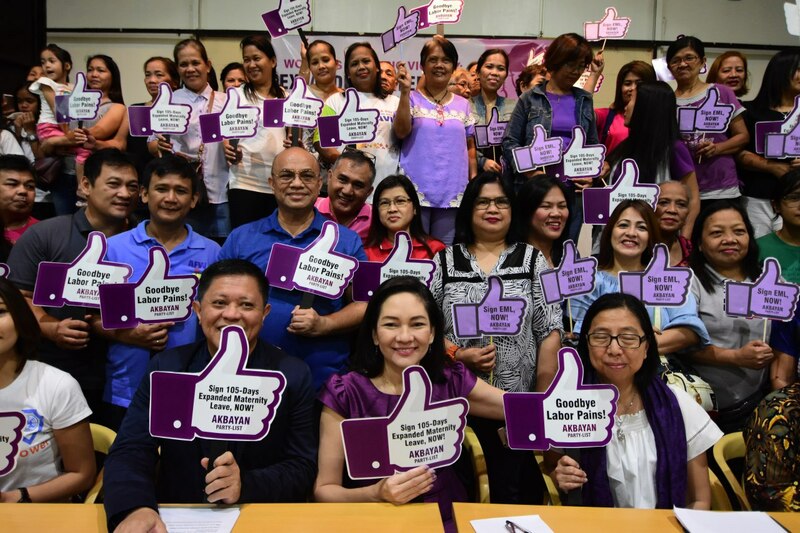 It is an added package to our Reproductive Health Law”, said Mylene Hega of Akbayan Women. Akbayan Women sees that that the passage of expanded maternity days, could introduce into the mainstream the realities of reproductive work of physical child bearing, nurture and care towards the child.